1. 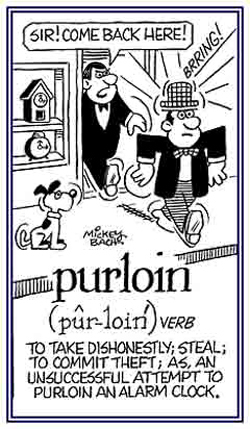 Containing a proviso; that is, conditional and not permanent. 2. Provided or serving only for the time being; temporary. 1. A power of attorney document given by shareholders of a corporation authorizing a specific vote on their behalf at a corporate meeting. 2. The function or power of someone who is authorized to act as the deputy or substitute for another person. 3. Etymology: from about 1440, prokecye, "agency of one who acts instead of another"; contraction of Anglo-French procuracie, from Middle Latin procuratia, "administration"; from Latin procuratio, "care, management" from procurare, "to manage". 1. To steal or, in other words, to take something that belongs to another person: Roy's neighbor was caught purloining a bottle of wine at the local store. 2. 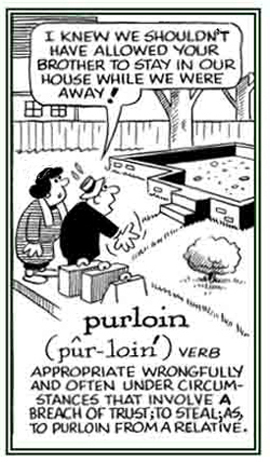 Etymology: from purloinen, "remove, make distant, misappropriated"; borrowed through Anglo-French purloigner, purloiner, "remove" and directly from Old French porloigner, "put off"; from pur-, "forth"; from Latin pro-, "for, forth" + Old French loing, loin, "far"; from Latin longe which is from longus, "long". © ALL rights are reserved. A reference to taking something dishonestly: "Bruce was using a purloined pen from his company's office to write notes at home." "Adam had a purloined book from the library in his book case." Someone who takes something that belongs to another person, from a store, etc. : Jillian's sister was accused of being a purloiner of books from the local book store. 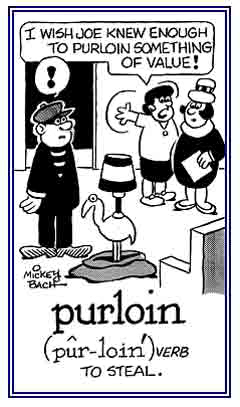 A purloiner was caught trying to steal a lamp shade which she used as a hat and pretended not to know what lamp shade the police officer was talking about. 1. 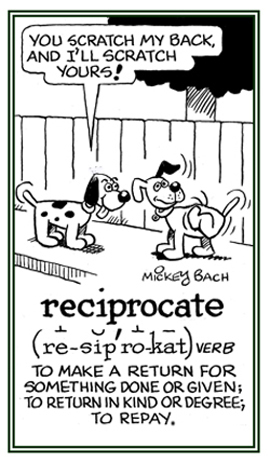 A reference to something that is mutual or done in return; given or felt by each toward the other; mutual: James and Jerry had a reciprocal respect for each other. 2. Given, performed, felt, etc., in return; given or shown by each of two sides or people to the other. 3. Conveying a corresponding; matching; complementary; equivalent: The members of the fitness studio were able to have reciprocal privileges at other health clubs. 4. In grammar, with reference to a pronoun or verb; expressing mutual relationship or action: "Each other” and “one another” are reciprocal pronouns. 5. Inversely related or proportional; opposite. 6. Etymology: from Latin reciprocus, "turning back the same way, alternating", which stands for reco-procos and is a compound of the adjectives recos, "turning backward", and procos, "turning forward"; therefore, reciprocus originally meant "turning backward and forward". 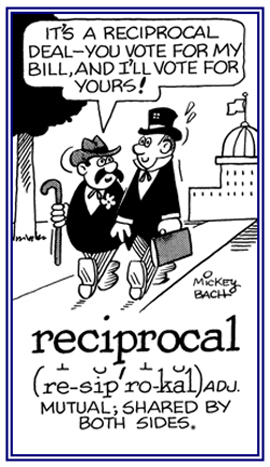 Reciprocal, when all things are considered, is a compound adjective based on the elements re-, "back, backward" and pro-, "for, forward". A relation of mutual dependence or action or influence. Descriptive of what affects the other and is equally affected by it; interchangeably; mutually. The quality or condition of being equally mutual in returning something. Pertaining to something that causes or moves backward and forward. 1. An action or an arrangement that involves two people or groups of people who behave in the same way or agree to help each other and give each other advantages. 4. In prosthodontics, the means by which one part of an appliance is made to counter the effect created by another part. Prosthodontics refers to a dental specialty concerned with the restoration and maintenance of oral function by the replacement of missing teeth and structures by artificial devices or prostheses. 5. In electronics, a process by which a reciprocal impedance (or network) is derived from a given impedance (or network). Given or done or owed to each other. 1. 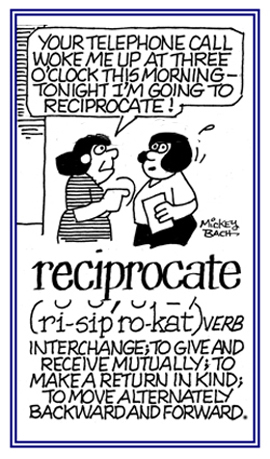 A condition or relationship of a mutual dependence or action or influence. 2. A cooperative interchange of favors or privileges; especially, the exchange of rights or privileges of trade between nations. 3. An arrangement in personal licensure whereby one jurisdiction accepts another jurisdiction's prior issuance of a license to practice medicine, and the individual is not required to demonstrate again through examination or otherwise that he or she meets minimum levels of competence required for a license. 4. An arrangement between governments whereby their nationals are entitled to certain stated medical care or other benefits on an agreed basis. 5. In anthropology, a system in which the exchange of goods is conducted within the groups of a society or community according to a prescribed ritual. © ALL rights are reserved. Reciprocity in the news: "Talking tough on trade, Paris seeks 'reciprocity' "
The French agriculture minister Thursday (May 31, 2007) warned that France could use its veto powers to block a global trade deal that did not protect European agricultural interests. 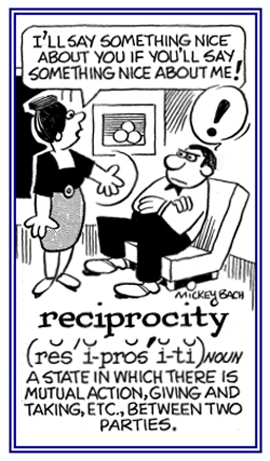 The French minister, Christine Lagarde, said, "The need for reciprocity is imperative. We will not see a breakthrough in global trade talks until we see exact figures from the United States that show reciprocity and balance." Internatioal Herald Tribune, Fricay, June 1, 2007; page 1. 1. To bring again into material existence; to create or form anew; specifically, in biology to form (a lost limb or organ) afresh; to generate (new individuals). 2. To bring about again; to effect, exhibit, or present anew; to repeat in some fashion. 3. To repeat in a more or less exact copy; to produce a copy of (a work of art, picture, drawing, etc. ), now especially, by means of engraving, photography, or similar processes. 4. To create again by a mental effort; to represent clearly to the mind. Showing page 14 out of 15 pages of 215 main-word entries or main-word-entry groups.